This article is about the original island from Donkey Kong Country 2: Diddy's Kong Quest. For King K. Rool's artificial island in Donkey Kong 64, see Crocodile Isle (Donkey Kong 64). Crocodile Isle is the place Diddy Kong and Dixie Kong adventured through in Donkey Kong Country 2: Diddy's Kong Quest and Donkey Kong Land 2, presumably the place of origin of the Kremlings. In contrast to Donkey Kong Island which is ecosystemically preservative, Crocodile Isle is a gloomy and dark place in a state of pollution and barrenness, as evidenced by the dead trees, toxic waste, and the garbage surrounding the swamps and Klubba's Kiosk. Almost all of Crocodile Isle is shrouded in fog; swampland is also found almost everywhere on the island. The coast of Crocodile Isle is almost constantly battered with rough currents, which over the years have wrecked several ships on the island's rocky coast or swamped them in the island's bogs. Several parts of the island are volcanic, and the top of the island, where K. Rool's Keep is located, is frozen over. Crocodile Isle is apparently in close proximity to Donkey Kong Island, as said island can be seen from both the remains of the Gangplank Galleon and K. Rool's Keep. Located inside Crocodile Isle is the Kremling Lost World, the apparent birthplace of the Kremling species. The Lost World also contains a altar-like structure built into an crocodile-shaped volcano called Krocodile Kore, which serves as the island's core. The island has a massive Zinger and Bramble infestation. During the events of Donkey Kong Country 2: Diddy's Kong Quest and its pseudo-port Donkey Kong Land 2, Diddy and Dixie Kong adventured through Crocodile Isle in their search for the recently kidnapped Donkey Kong. If players manage to obtain the "best" ending in Donkey Kong Country 2, Kaptain K. Rool will end up clogging the volcano in Krocodile Kore, causing an explosion which will cause Crocodile Isle to sink into the sea, while K. Rool escapes on a raft, laughing. In the GBA version and Donkey Kong Land 2, however, K. Rool's clogging of the volcano does not cause the island to explode. The map layout is also reversed in these versions. Gangplank Galleon: The scuttled remains of K. Rool's ship from the previous game, now depicted as being much larger. Krow is fought here. Crocodile Cauldron: A magma-filled cave fairly close to sea level, appearing in the various iterations of Donkey Kong Country 2: Diddy's Kong Quest. Kleever is fought here. Krem Quay: A polluted marshland that was the island's former main port, appearing in the various iterations of Donkey Kong Country 2: Diddy's Kong Quest. Kudgel is fought here. Krem Cauldron: A combination of the above two areas, exclusive to Donkey Kong Land 2. Kleever is fought here. Krazy Kremland: The island's amusement park, currently in disrepair and with a massive Zinger infestation. King Zing is fought here. Gloomy Gulch: A haunted forest of dead trees, some of which have sinister faces. Kreepy Krow is fought here. K. Rool's Keep: Kaptain K. Rool's fortress atop the icy summit. In the SNES version, there is no boss here, but in the GBA version, Kerozene is fought here. The Flying Krock: A massive flying battleship connected to K. Rool's Keep via a long ladder that goes through the bramble thickets. Kaptain K. Rool is fought here. Lost World: A mysterious underground jungle whose many entrances are guarded by Klubba. Kaptain K. Rool is fought a second time here. 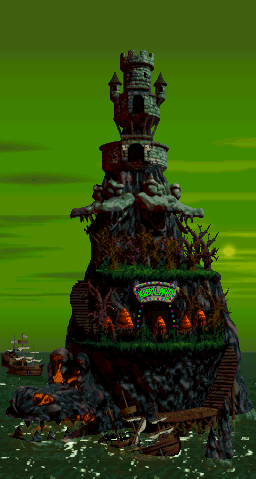 Though Crocodile Isle never directly appeared on the Donkey Kong Country animated series, several Kremling characters such as King K. Rool and Kaptain Skurvy would sometimes mention the "swamps back home". The newly constructed Crocodile Isle from Donkey Kong 64. In Donkey Kong 64, a newly constructed Crocodile Isle appears, now equipped with powerful weapons to aid in the destruction of Donkey Kong Island. In the obscure Donkey Kong comic Bumm-Badabumm im Urwald, Crocodile Isle never made a direct appearance, though several locations ventured through in the comic, such as a Krochead and a crashed ship-filled swamp, along with the "Lost Land", are obviously based off areas of Crocodile Isle. Boss Bossanova - Boss battle theme in Donkey Kong Country 2: Diddy's Kong Quest which is an arrangement of "Welcome to Crocodile Isle"
Crocodile Cacophony - K. Rool's battle theme in Donkey Kong Country 2: Diddy's Kong Quest which is an arrangement of "Welcome to Crocodile Isle"
Crocodile Cacophony - An excerpt of the arrangement from Super Smash Bros. Ultimate, featuring "Welcome to Crocodile Isle"
This page was last edited on April 16, 2019, at 12:47.